I’ve been teaching Bolognese swordsmanship for many years now, and one of the most important things to understand is that it’s actually all one system, not a collection of tricks for each weapon combination. I work primarily out of Manciolino, with some additions from Marozzo. Both of these authors use sword and small buckler as their primary teaching system, and I follow this pedagogy as well. The buckler teaches dual hand use right from the start, and also gives students a great focus point for cutting actions. One of the things that many people miss is the instructions for how to use the buckler. We get some simple instructions regarding how to hold the buckler in Manciolino and a relatively unhelpful instruction for how to use it to parry. What we really need to understand is that the use of the offhand in defence is really embedded in the sword and dagger material, which is where Marozzo really comes into his own due to his quite comprehensive instructions. A prime example of how this works is the crosswise parry with the offhand against the riverso. (Right handed fencers is assumed in this discusssion.) In the buckler material we get the unhelpful instruction to “defend the head with the buckler” from both authors. In sword and dagger though, Marozzo tells us to turn down the point and parry the blow with the true edge. 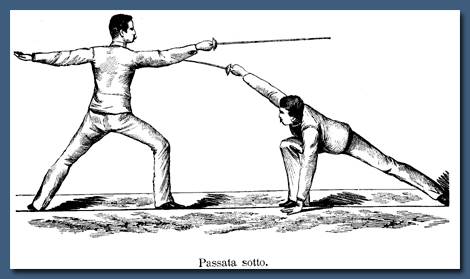 This thumb down hand position (1st hand position in Classical Italian fencing) is a strong skeletal alignment, that forms a true cross against the opponent’s sword. The parry is also made close to the furniture on the oponent’s forte, preventing redirection. Now when it comes to holding the dagger, the hilt is held exactly the same way we hold the buckler handle, so this parry should work exactly the same way in sword and buckler and lo and behold it does. Our natural inclination to make the buckler parry with the hand in 3rd (thumb up) creates a weak collapsible skeletal alignment, but the thumb down position doesn’t! Without this dagger instruction, we wouldn’t understand the buckler parries, which is to use it exactly as we would with a dagger true edge parry. The instructions for holding the buckler tell us how to hold the dagger, but the dagger material really fills in the blanks for using the buckler to parry. Together, it all makes one comprehensive teaching system! So the upshot of this post is that if you want to study Bolognese Swordsmanship, you can’t study the individual weapon combinations in isolation but need to look at the material holistically. I’ve been teaching the sword and dagger material this way over the last term in 2016, with reference back to the buckler material, and have seen the understanding of my students go through the roof! Bolognese Swordsmanship isn’t just a collection of tricks for using different weapons combinations, it’s actually a beautiful art and system that teaches you core principles that can be applied to all weapon combinations! I love it, and it will reward you if you take the time to really plumb it’s depths. Invitations are a passive action designed to place your opponent into obedience, so that you can control their attacking action with a suitable defensive response. We have 2 primary types of invitations being taught in this lesson: those designed to set up parry response and those designed to evade blade engagement with cavazione. The first type of invitation is the classic type of invitation, where we leave a line open for the opponent to make a direct attack, setting them up to hit them via parry riposte. The key here is to make the invitation in such a fashion that the opponent is constrained in the available options for a direct attack, and that they do not feel threatened by our sword point. The second type of invitation is one where we place our point in line, so that the opponent must first engage our blade to make their attack. We will use the tempo of their gaining action to avoid the contact and then hit them with an attack by disengagement. The key here is to place the point in line in such a manner that the blade engagement is readily obvious, forcing the opponent to move into a particular line. We want them to feel threatened by our point in line, so that they are forced to attempt to engage our sword. From Guardia Terza, the move the hand so that the sword moves to close the high outside line (Invitation in 3rd), exposing the high inside line to a direct attack. In response to the invitation, the opponent shall extend their arm and begin a direct attack on the lunge to the high inside line. As the opponent commences their attack, deflect the extended sword with a parry of 4th (gain to the high inside line), and riposte with a thrust by glide to the opponent's high linside line. Repeat 5 times then reverse roles. From Guardia Terza, the move the hand so that the sword moves to close the high inside line (Invitation in 4th), exposing the high outside line to a direct attack. In response to the invitation, the opponent shall extend their arm and begin a direct attack on the lunge to the high outside line. As the opponent commences their attack, deflect the extended sword with a parry of 3rd (gain to the high outside line), and riposte with a thrust by glide to the opponent's high outside line. From Guardia Terza, the move the hand so that the sword moves to close the low outside line (Invitation in 2nd), exposing the low inside line to a direct attack. In response to the invitation, the opponent shall extend their arm and begin a direct attack on the lunge to the low inside line. As the opponent commences their attack, deflect the extended sword with a parry of low 4th (gain to the low inside line), and riposte with a thrust by glide to the opponent's low linside line. From Guardia Terza, extend the sword so that the point threatens the opponent on the high inside line. The sword tip should be in front of the opponent's guard and about a fist length up and to the inside of the opponent's guard, along the diagonal line. In response to the extended sword, the opponent moves to parry the sword with the parry of 4th (gain to the high inside line). As the opponent moves to parry / gain the sword, cavazione clockwise to engage the opponent's sword in the high outside line, followed immediately with a thrust by glide to hit in the high outside line. From Guardia Terza, extend the sword so that the point threatens the opponent on the high outside line. The sword tip should be in front of the opponent's guard and about a fist length up and to the outside of the opponent's guard, along the diagonal line. In response to the extended sword, the opponent moves to parry the sword with the parry of 3rd (gain to the high outside line). As the opponent moves to parry / gain the sword, cavazione counterclockwise to engage the opponent's sword in the high inside line, followed immediately with a thrust by glide to hit in the high inside line. From Guardia Terza, extend the sword so that the point threatens the opponent on the low inside line. The sword tip should be in front of the opponent's guard and about a fist length down and to the inside of the opponent's guard, along the diagonal line. In response to the extended sword, the opponent moves to parry the sword with the parry of low 4th (gain to the low inside line). As the opponent moves to parry / gain the sword, cavazione counterclockwise to engage the opponent's sword in the low outside line, followed immediately with a thrust by glide to hit in the low outside line. From Guardia Terza, extend the sword so that the point threatens the opponent on the low outside line. The sword tip should be in front of the opponent's guard and about a fist length down and to the outside of the opponent's guard, along the diagonal line. In response to the extended sword, the opponent moves to parry the sword with the parry of 2nd (gain to the low outside line). As the opponent moves to parry / gain the sword, cavazione clockwise to engage the opponent's sword in the low inside line, followed immediately with a thrust by glide to hit in the low inside line. As with any weapon, the counterattack is an important part of the repertoire in spadone. In spadone vs spadone fights it really comes into it's own since the actions can be relatively slower compared to a single handed sword or longsword fight. Switch roles at the end of the hall. Repeat this time throwing a redoubled tondo with each main cut. Partner Drill, each in Right Guard Point Forward. Attacker throws a mandritto to the head on a right step. Defender counterattacks with a mandritto to the forearms on a pass right at 45 degrees. Repeat the sequence, starting from Left Guard, Point Forward, and throwing riversi. Defender counterattacks with a mandritto tondo (helicopter cut) to the head on a pass right at 45 degrees. Repeat the sequence, starting from Left Guard , Point Forward, and throwing riversi. Drill in groups of 3, with attacker in centre with spadone, defenders with boffers. Attacker starts from Right Guard, Point Behind, and steps forward throwing mandritto on a right step and riverso on a left step (X cuts). Volta stabile to the rear and on the left step throw a riverso followed by a mandritto on a right step. Repeat 2, throwing the rising cuts instead of the descending cuts. Switch roles after the attacker has done all 4 cuts, and continue until all 3 partners have been the attacker. Attacker starts from Right Guard, Point Behind, and throws redoubled cuts at the person in front, and then turns and attacks / counterattacks the person on the other side. Defenders try to hit the spadone wielder. Continue until either the defenders or the attacker is dead. Note: This is a coached bouting drill. There are 3 variants to this parry, and we explored all 3 of them, and looked at the problems with trying to parry the low outside line with a falso. When the opponent thrusts into our high inside line, the falso parry is performed by cutting a falso with the point up from Porta di Ferro Stretta to Sopra il Braccio. If the thrust drops to the low inside line, the transition is a point down falso to Sotto il Braccio. If the thrust is to our high outside line, the falso parry is made as an extension into Guardia di Faccia, whilst turning the hand into 4th in 3rd. If the thrust goes to the low outside line, you do not parry it with a falso, as it doesn’t close the line. From Porta di Ferro Stretta, when the enemy passes with the left foot to throw the thrust, parry with the false edge without moving your feet. When the enemy throws the riverso, pass left parrying the riverso by turning your true edge towards his sword, and defending your head with your buckler. Riposte by checking the enemy's sword with your buckler and throwing a stocatta to the face or chest, and then jump backwards, ending in Porta di Ferro Stretta. Check their sword and stab them with a rising thrust. This sequence actually shows how the falso parry sets you up to quickly parry an subsequent redoubled blow, which is the teaching aim of this drill. From Porta di Ferro Stretta, when the enemy passes left to throw the punta, traverse with the left foot and parry with a falso, ending in Guardia di Faccia. When the enemy throws the riverso to the leg, pass right and parry with a rising mezzo riverso, and riposte with a mandritto traversale to the sword arm, defending the head with your buckler. Pass back with the right foot into Guardia di Faccia, and then pass back the left foot ending in Porta di Ferro Stretta. This time the enemy provokes with the thrust through the high outside line, so that they can redouble to the low outside line. The falso is done as the extension into Guardia di Faccia with a traversing step of the left foot. This helps reorient the extending sword into the incoming thrust, creating a good crosswise opposition to the incoming sword. We then follow this with the correct parry against any outside blow to the leg, which is the rising mezzo riverso cut into the blow, and should be recognisable to modern fencers as the parry of 2nd. The riposte to the sword arm is made on the corrective step, and we finish with another classic Bolognese defence, the retreat behind the extended sword. (Colloquially called the F$%# Off defence when I teach it!) It’s designed to stop the enemy chasing you down. Mandritto to Sopra il Braccio & riverso to Coda Lunga from Guardia Alta on a pass left and a pass right. Mandritto to Sotto il Braccio & rising riverso to Guardia Alta from Guardi Alta on a pass left and right. Fendente & Tramazzoni from Guardia Alta on a pass left and right. If the thrust is to our high outside line, the falso parry is made as an extension into Guardia di Faccia, whilst turning the hand into 3rd in 4th. From Porta di Ferro Stretta, attacker throws a thrust to the high inside line. Defender parries with a falso to Sopra il Braccio. From Porta di Ferro, attacker throws a thrust to the high outside line on a left pass. Attacker redoubles with a mandritto to the head on a traverse right. This week we revised redoubled actions with the spadone. This is in response to the difficulty students had in the previous lesson with the bridge drill. From Right Guard, Point Behind throw a mandritto to the head on a right step forward. Without moving the feet, allow the sword to continue in a descending circular path, returning for a 2nd mandritto to the head. From Left Guard, Point Behind throw a riverso to the head on a left step forward. Without moving the feet, allow the the sword to continue in a descending circular path returning for a 2nd riverso to the head. From Right Guard, Point Behind throw a mandritto to the head whist stepping forward with the right foot. Continue the cut as a circular and as the sword begins to travel upwards, lift up your hands and turn them such that the sword travels over your head finishing as mandritto tondo to the left temple of the opponent. The tondo cut should have a slight downwards angle to provide some cover to the head. After the tondo cut is complete, recover back into Left Hanging Guard with a volta stabile. From Left Guard, Point Behind throw a riverso to the head whilst stepping forward with the left foot. After the tondo cut is complete, recover back into Right Hanging Guard. From Right Guard, Point Forward throw a rising mandritto to the flank whilst stepping forward with the right foot. Lift the hands up to head height and allow the cut to continue as a circular cut, turning the hands so that travels over your head finishing as a mandritto tondo to the left temple of the opponent. After the tondo is complete, recover back into Left Hanging Guard. From Left Guard, Point Forward throw a rising riverso to the flank whilst stepping forward with the left foot. Lift the hands up to head height and allow the cut to continue as a circular cut, turning the hands so that travels over your head finishing as a riverso tondo to the right temple of the opponent. After the tondo is complete, recover back into Right Hanging Guard. From Right Guard, Point Behind throw a mandritto on a right step to draw the parry. Redouble with a riverso on a left step. Repeat for the rising cuts. Attacker with spadone, 3 defenders with broadswords. Attacker uses redoubled actions to hit the defenders. Defenders attempt to hit the attacker. Repeat changing the attacker after 30 seconds. This lesson builds on the work from the previous lesson with molinelli. In this one we look at the horizontal molinelli applications which provide different results than the vertical molinelli of the previous lesson. From Right Guard, Point Forward against the mandritto cut falso dritto to Right Head Guard on a volta stabile and continue the horizontal molinetto into a mandritto on a right step forward. From Left Guard, Point Forward against the riverso cut falso manco to Left Head Guard on a vlota stabile and continue the horizontal molinetto into a riverso on a left step forward. From Right Guard, Point Forward against the riverso cut mezzo riverso to Right Head Guard, and then push the tip over the sword and down sweeping with the false edge to the left (mandritto tondo falso) to expel the sword and then return with a riverso tondo to the flank. From Right Guard, Point Forward against the mandritto cut mezzo mandritto falso and then push the tip over the sword and down sweeping the true edge to the right (riverso tondo) to expel the sword and then return with a mandritto tondo falso to the flank. From Left Guard, Point Forward against the mandritto cut mezzo mandritto to left Head Guard and then push the tip over the sword and down sweeping the false edge to the right to expel the sword and then return with a mandritto tondo to the flank. From Left Guard, Point Forward against the riverso cut mezzo riverso falso and then push the tip over and down sweeping the true edge to the left to expel the sword and then return with a riverso tondo falso to the flank. 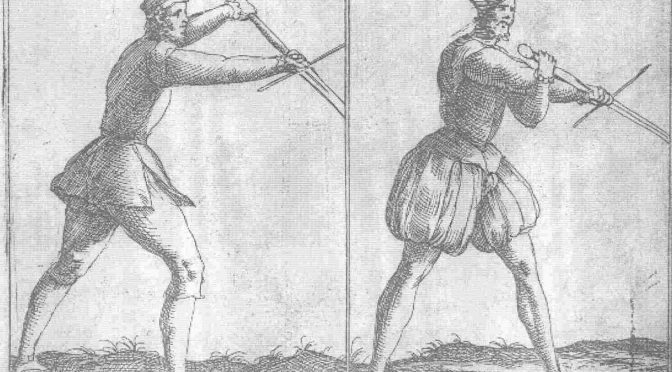 Two on one drill, the two using single handed swords at either end, with the spadone wielder in the centre. Spadone wielder uses pass and turn with molinelli to to keep the swordsmen from crossing. Swordsmen attempt to hit the spadone wielder with a good down right blow. Molinelli are full circular cuts that deliver one of the most powerful cuts possible with the great sword. The key to the cuts are gravity and momentum, however this is also the factor that can also lead to losing control of the weapon. The purpose of these drills is to learn the basics of the molinelli, and how to control the high levels of momentum they harness. In all case we are practicing the molinelli both as mandritti and as riversi. The advantage of the molinello is that it will initially pass through the hanging guard position, which allows us to parry our opponent's attack safely and follow it with a powerful riposte, all in one continuous motion. The key to these drills is understanding that the transition into the hanging guard is not only our parry position, but the initial charging to allow gravity and momentum to allow us to smoothly continue the action to deliver the riposte. From Right Guard, Point Forward defend the mandritto with a molinello and mandritto on a right pass. The parry should be when the sword passes through Left Hanging Guard. From Right Guard, Point Forward defend the riverso with a molinello and riverso and crossing right pass to the left. The parry should be when the sword passes through Right Hanging Guard. From Left Guard, Point Forward defend the riverso with a molinello and riverso on a left pass. The parry should be when the sword passes through Right Hanging Guard. From Left Guard, Point Forward defend the mandritto with a molinello and mandritto and crossing right pass to the right. The parry should be when the sword passes through Left Hanging Guard. From Right Guard, Point Behind defend the mandritto with falso mandritto and mandritto (false edge led molinello) on a right pass. From Right Guard, Point Behind defend the riverso with a falso dritto and mandritto tondo on a right pass. From Left Guard, Point Behind defend the riverso with riverso falso and riverso on a left pass. From Left Guard, Point Behind defend the mandritto with falso manco and riverso tondo on a left pass. I’m half way through the second term of classes in Italian Duelling Sword that I’ve been offering at Stoccata Drummoyne. I’m actually loving the chance to teach this material, because it’s me putting into practice my Instructor at Arms certification from Sonoma State University. Italian Duelling sword is just a fancy description for Classical Fencing, which is not generally understood by the public. Rather than trying to explain what it is everytime, I’m finding people get it straight away when I call it Italian duelling sword! It also happens to be the description used by one of the 19th Century authors, so I feel like I’m on solid ground here. We’re working on the thrusting sword material to begin with (fioretto & spada) and I’m aiming to work into the sabre material in future terms. So this post is mostly for my students who wanted to know the sources for what I teach. So here’s the list of text I’m working from. – this is the foundation text I use for planning lessons etc, and where most of the terminology comes from. – This is the source of the guard names I actually use in class, and the basis for the more extended guard I teach compared to Gaugler’s material. So in summary, if you can find a copy, get Gaugler. Regardless, buy a copy of Chris’ translation of Parise and that will cover you for thrusting sword. For sabre, the Barbasetti manual is online, just have a dig for it. Again Chris’ translation of Radaelli is really good and well worth buying as well. I was recently chatting with people on the Bolognese swordsmanship group on Facebook, and came to the realisation that most people don't realise that the instructions Manciolino gives may not necessarily be complete instructions. This became especially apparent when we were discussing provocations. Provoke him with a strong mandritto. It's fairly innocuous as a play, but it leaves an awful lot unsaid. There's no discussion at all regarding how to throw the blow, what foot work to use, or what we are trying to achieve with the provocation. Since this can actually teach us a lot about the system, I think it's worth while to examine this play in some detail. As he lifts his hand to cut mandritto, stifle the blow with a thrust to the hand. Extend your sword into Guardia di Testa, and then throw a mandritto that ends in Sopra il Bracchio. So that's probably what Manciolino is referring to in the defence, the extension of the hand into Guardia di Testa, which also works quite efficiently from Guardia di Faccia. We're now seeing how it should be quite possible to provoke a response from Guardia di Faccia. First we lift our hand into Guardia di Testa, and then we throw a mandritto on a step. The mandritto from Guardia di Testa is quite a strong one, so we now have the blocks to build a provocation with a strong mandritto from Guardia di Faccia. Well maybe a couple of foundation blocks. Slip on the charging action, which will then allow us to pass left or right from the intermediate passo stretto stance. Lets look at the individual footwork cases in a bit more detail. Starting with the left pass scenario, we're going to charge the blow into Guardia di Testa, and then hit with a strong mandritto on the left passing step. From this mandritto we can finish in either the guards of Cingiaria Porta di Ferro or Sopra il Braccio or Sotto il Braccio, or redouble with a riverso or a rising riverso or a falso manco. All fairly conventional stuff as far as the system goes, but we do have to consider the very real vulnerability we have for being counterattacked on our outside line. For the pass right scenario, we're going to charge the blow into Guardia di Testa, and then hit with a strong mandritto on the right passing step. From this mandritto we can end in either the guards of Porta di Ferro Stretta or Sopra il Braccio or Sotto il Braccio, or redouble with a riverso or a rising riverso or a falso manco or even a second mandritto. Again all fairly conventional, and slightly safer because we have the buckler covering the inside line against the direct counterattack. For the slip on the charging action scenario, we are actually going to slip the front foot to our rear foot as we extend the sword into Guardia di Testa. This will pull our torso back a fraction, and place us in an unstable stance that allows us to pass either left or right depending on our preference or opportunity. The options that then follow remain the same as those listed above for the left or right passing steps. Right, so we know our charging action, and the footwork we'll be using, but we haven't actually discussed how the mandritto should be thrown. Is it close to the opponent's sword or wide? Where do we position the buckler as we throw the blow? All of these details won't get resolved unless we understand what sort of response we want from the opponent with our provocation. Are we trying to provoke a parry from the opponent, or a counterattack? These are two very different scenarios which we'll need to look at in detail. If we are throwing the strong mandritto to draw a parry from our opponent, we are using the concept of attack by second intention. Our intention is to have the first blow parried by the opponent, leaving us safe to hit with a redoubled blow to a now exposed target. Let's look at the individual cases with a bit more detail to understand this concept. We'll begin by examining the scenario where we will be passing left, starting from a right foot forward or passo stretto stance. Our charging action is to lift the hand into Guardia di Testa, and this can present some interesting opportunities for us. If our opponent is also in Guardia di Faccia, the charging action can also be used to pick up the debole (tip) of the opponent's sword preventing their direct thrusting attack. This then leaves us free to pass left throwing our mandritto which will turn outside their sword to hit them to the head as a grazing cut. We want to cut close to their sword, so that they have no space to counterattack us, forcing our desired parry of the mandritto. The parry in this case is typically either Guardia d'Alicorno as it's a quick convenient defence of the head, or the opponent may roll their hand into Guardia di Testa. If you haven't picked up the tip in the attack, an experienced opponent may also try to use a false edge parry ending in Guardia di Faccia (not recommended as it drags the mandritto in to the head), or they may even pass back into Coda Lunga Alta to void the blow. In all of the above, the defence is going to be in the high line, which is vulnerable to a redoubled riverso attack to the outside line, and especially to the flank or leading thigh. In all cases, we use the buckler to defend ourselves against the direct riposte that should follow the opponent's parry. What about if we're set to make the attack on the right pass? This where we are starting from a left foot forward, or passo stretto stance, that allows us to pass right. The charging action remains the same with the extension into Guardia di Testa. However, due to the right shoulder being withdrawn in this stance we don't get the chance to collect the opponent's sword tip as we do so. Instead, we have to push our buckler forward towards the opponent's sword hand as we make this charging action to prevent them counterattacking our hand. Once charged, we can throw a strong mandritto on a right passing step, gliding down the opponent's sword with our buckler as we do so to keep ourselves safe. This is going to force our opponent to either extend their buckler into Guardia di Testa to defend their head from the mandritto, or to free their sword and parry with the false edge transitioning to Guardia Sopra il Braccio. 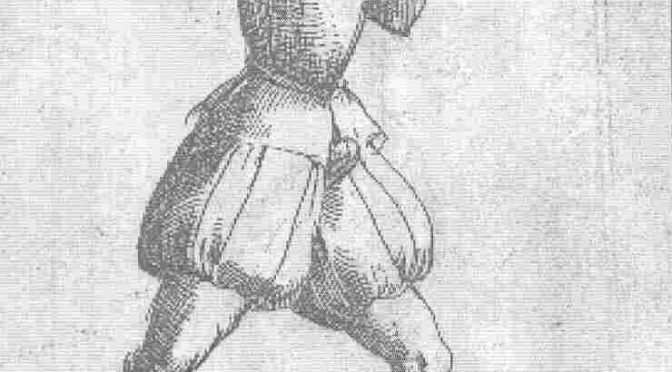 Regardless of whether the opponent parries with their buckler or their sword, they will have exposed their abdomen and thigh to a redirected or redoubled mandritto cut below the parry, or a riverso to the right side of the head or neck again as a redirection or redoubled cut. The mandritto on the right step also gives us a third follow up action, which is to roll the hand upwards into Guardia d'Alicorno to deliver an imbrocatta thrust that turns around the opponent's defence. In both scenarios, notice how we preformed an action that would deny the opponent a direct line through which they could counterattack, forcing them to commit to a parrying action to prevent themselves being hit. This is the crucial aspect of throwing actions in second intention as we must place the opponent into a position where they must parry. If we allow them freedom to counterattack instead of parrying we would now be now using a provocation in countertime, which is a completely different kettle of fish. Oh and it should go without saying that if the opponent doesn't parry the first intention attack, we really should be hitting them in the head with that strong mandritto! If we are throwing the strong mandritto to draw a counterattack from our opponent, we are using the concept of countertime. Our intention is to have the first blow counterattacked by the opponent, which we intend most probably to parry leaving us safe to riposte to a now exposed target. We could also be looking to counterattack into the opponent's counterattack, but for the strong provoking mandritto from Guardia di Faccia this is extremely difficult to set up. Again, let's look at the individual cases with a bit more detail to understand this concept. As discussed above, we can be either left foot or right foot forward, or even in a passo stretto stance. In all cases we need to look at what is the most likely counterattack we can set up that will put us in a from which we can parry in safety. We already know this from our discussion of blow mechanics, as we are told to attack into the preparation with a thrust to the hand as the opponent lifts their hand to charge their mandritto. Thus we should expect our opponent as a sensible fencer to do just this, to thrust at our hand as we charge the blow. So let's look at how we can set up ourselves for success from each beginning stance. When we begin with Guardia di Faccia in a left foot forward stance, our buckler is already fully extended, so as we lift our sword to charge the blow we can't really cover the sword hand against the counterattack because we have to lift the buckler into position by lifting the arm up from the shoulder. This defensive action is slow in comparison to the opponent's counterattack so it's vulnerable to being beaten. So we either need to slow down the opponent's counterattack by disguising our action, or extending the tempo of the counterattack. Since this is a provocation, we really don't want to disguise our action otherwise we will get a response different to the one we wish to propagate, which leaves us with the option of extending their tempo. We can best achieve this extension of the opponent's tempo through the use of footwork, or more precisely using the slip to extend the measure, and hence the tempo our opponent must use. So as we lift our hand into Guardia di Testa, we must also slip our left foot back to the right making a passo stretto stance. This now leaves us dealing with a thrust to the hand when we are in Guardia di Testa in a passo stretto stance. Similarly, if we start in a right foot forward stance we are going to have difficulty covering the sword hand as it charges the blow, with our buckler. Admittedly, this covering action is faster because we can turn the left shoulder forward as we lift the sword hand to charge the blow, but again it's not as fast as the counterattack coming from our opponent. As before, we can use the slip to bring the right foot back to the left to bring us into Guardia di Testa in passo stretto. Functionally, this position is identical to when we slipped back from the left foot forward position, so the responses will be the same for both stances. We should look at the slip footwork in a little more detail, as this will affect which response we use to defeat the opponent's counterattack. When we slip the front foot back, it can either move directly back parallel to the line of engagement, in effect squaring the body up towards the opponent. In this case we have maintained the separation between the feet, which should be about the width of our feet, as per Manciolino's description of the passo stretto stance. This type of slip will shift the body towards the slipping foot in relation to the line of engagement, so left on a left foot slip and right on a right foot slip. However, it is also very common to bring the heels of the feet together during the slipping action, typically ending with the feet touching. In this type of slip the body will tend to move towards the stationary foot with respect to the line of engagement, that is to the right on a left foot slip and to the left on a right foot slip. For our purposes we shall just consider the direction the body will have shifted with respect to the line of engagement when looking at what our response should be to the counterattack. Parry the enemy’s thrust with the sword. OK so we've slipped back into Guardia di Testa in passo stretto, and the thrust is coming towards our sword hand. A part of our response to the counterattack should include some form of action to remove the sword hand from the direct attacking line. If our body has moved to the left during our slip, we are effectively on the outside of the opponent's blade. From here our safest parry is to roll the sword hand into a shallow Guardia d'Alicorno, which will lift the sword hand up and to the left of the incoming thrust, whilst turning the sword tip down to parry the thrust to our hand. Once the thrust is parried, we can riposte by driving a thrust into the flank of the opponent with an extension of the sword hand in the second hand position and passing with the left foot. As we do so, we push our buckler towards the opponent's sword hand to prevent them from making a redoubled blow, so that we can hit without being hit. It's a strong riposte that the opponent will have great difficulty avoiding. If we moved to the right on our slipping action, we have effectively moved to the inside of the opponent's sword. In this case we parry the incoming thrust by dropping the hand and making a mezzo mandritto across the line of engagement. In other words we make an inside parry with the true edge. Once we have parried the blow we can now drop the tip to extend into Guardia di Faccia and thrust strongly to the face with a right passing step. Against a really good opponent they may drop the tip to their outside to parry this thrust, turning it into a molinetto to the head. We can also counter this with either dropping the thrust into a flaconade outside their sword, or if we're a little late catch the molinetto with a parry of Guardia di Testa followed by a counter-riposte with imbrocatta. 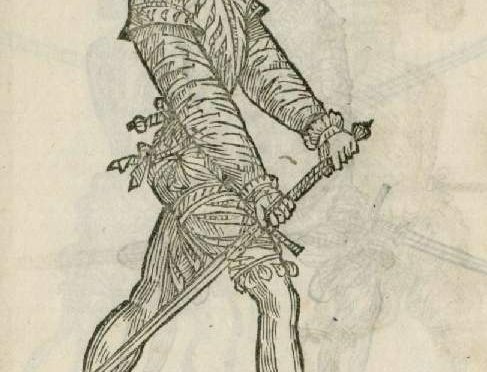 If we were a little exuberant with the mezzo mandritto, and instead making a beat parry against the opponent's sword we should be free to instead turn a riverso to the head on the right passing step, ending in Coda Lunga Stretta. Again, the two ripostes we can make here are very difficult for the opponent to counter. The situation is slightly different if we are starting from the passo stretto stance. We still have the problem of needing to extend the tempo of our opponent's counterattacking thrust to give us a safer reaction time, but don't have the option of slipping back as this will extend the measure of our riposte such that we have a low likely hood of being able to hit the opponent. In this case we need to use traversing footwork to expand the measure which will give us the extension of tempo that we require. Our choices become to either traverse left with the left foot or to traverse right with the left foot. Either of these traversing steps will be about the length of our foot, which will will move our torso just off the line of engagement, and the sword hand will turn towards the opponent withdrawing to just out of the extended measure of the opponent. The left foot traverse gives us the same options as when our body moved left with the slipping action, and the right foot traverse gives us the right body move response from the slipping action. Just like with the attack in second intention, if the opponent doesn't respond to our charging action we must complete the strong mandritto and hit them. If the opponent reacts with a parry to this mandritto, use the actions from the attack by second intention as we are now in that scenario. Our strong provoking mandritto begins with a charging action, which is to extend the arm into Guardia di Testa. Our associated footwork is determined by the stance we start in, and our desired type of provocation. We can use the provocation as an attack in second intention, in which case the initial mandritto is thrown in such a manner that we deny the opponent a direct line for a counterattack, forcing them to respond with a parry. We can alternatively use the provocation as an attack in countertime, in which case we use our footwork to expand the measure to just outside the extended measure of our opponent during the charging action of the mandritto. This will give us the tempo we need to parry the counterattacking thrust made at our sword hand, leaving us safe to riposte with a strong blow.